St. John's receives no funds whatsoever from either the government or the church. The cost of keeping our doors open, supporting our ministries, and sustaining the worship we offer is borne through the funds we raise as a parish. Our principal sources of income are the regular giving from our parishioners, income from the rent of our parish hall, and fundraising that takes place through the year. We are, therefore, very grateful indeed to all who contribute in any way financially to supporting the life of our parish. By far the best way of offering regular financial support to St. John's is by direct debit rather than by putting cash in the collection on a Sunday morning. A direct debit simply pays a set amount of money stipulated by you once a month from your bank account to St. John's bank account electronically. If you pay income tax in the UK and give money to St. John's, we can claim back the tax you have paid on that charitable gift. This means we can increase your gift by 25% without you paying a single extra penny. For example, if you gave St. John's £100, we could claim back an extra £25 from the government which would mean we received a total of £125. This applies to regular giving as well as one off gifts. Not claiming Gift Aid is simply throwing money away, and all it requires is for you to fill out a simple form and return it to us. 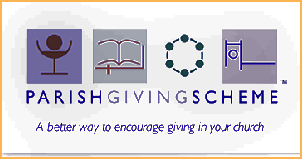 The Parish Giving Scheme (PGS) is the principal funding method used at St John’s. Donations made through this scheme use a Direct Debit claim on your bank account. This can be made on a monthly, quarterly or annual basis. Each donation is restricted to a parish church. Payments are taken on the 1st day of the month and are sent to our bank within ten days. This system is really helpful to us as a parish church, as Gift Aid is automatically claimed on eligible donations and sent direct to our bank account monthly, saving us the task of keeping separate records to enable a claim to be submitted to HMRC. Please consider using this method if you are a regular church member wishing to make your commitment to the ministry of St John’s. Clicking on the PGS logo on the right, will take you to their website’s home page where you can read full details of the scheme. St John’s have recently opened a charity account with BT MyDonate. This is a website accepting donations for many different charities, where people may make one off or regular gifts with added Gift Aid where appropriate. BT do not charge any commission on the donation, just the administration cost of the transaction is deducted from the amount sent to the church. If you would like to contribute to the ministry of St John’s Church, please click on the link to the right, which will take you to the secure website, where you will need to complete a few formalities and give your payment details. Thank you for taking the time and trouble to read this page, and we are very grateful if you feel able to support our work.